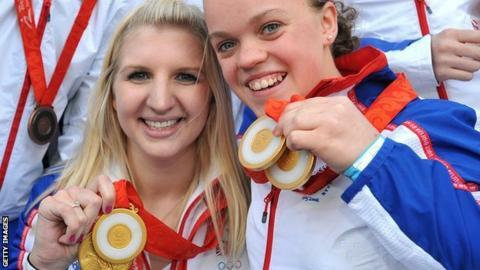 Adlington and Simmonds won Olympic and Paralympic honours in Beijing, but could they compete together one day? A survey in late 2011 suggested almost two-thirds of disabled people in the UK wanted an end to separate events. A recent BBC World poll revealed that, internationally, opinion is divided but Simmonds, who hopes to qualify for London 2012 this weekend, is clear. "For me I prefer them being separate," Simmonds told BBC Sport. "The Paralympics is an amazing event, the second biggest event in the sporting field and having everyone in the team makes it really enjoyable. A joint Paralympic and Olympic Games? "So I think it's great the way it is and that it's separate." Last year's poll for the charity Scope found that 42% of disabled people questioned did not believe the Paralympics had a positive impact on public perceptions of disability. Speaking shortly after its release, Baroness Tanni Grey-Thompson said the Paralympics would "disappear off the face of the earth" if a merger took place. "We wouldn't have an opportunity to showcase the vast majority of sports like we do now," she said. BBC Poll results: Should the Paralympics stay separate? Grey-Thompson, Britain's most successful Paralympian with 11 gold medals, added: "There is not a city in the world that could host a Games the size of the two combined." Her view is backed by Britain's two-time Paralympic champion swimmer Nyree Kindred. "Our Paralympic programme is nine days on its own, the Olympic programme is the same and you just wouldn't be able to get athletes to peak over a two-week period," said Kindred. "We have our own identity and I'm proud to be a Paralympian." European Champion and Beijing Olympian Fran Halsall added: "I think it would make it very long and you don't really want to make things too long. "I get bored watching myself swim for eight days, so having more and more swimming I don't think would work." Internationally, the idea of a merger was heavily backed in countries like Chile, France and Spain, but some of the most successful nations at the last Paralympic Games in Beijing, such as the US and China, showed the lowest support for the proposals. Simmonds, who became Britain's youngest ever individual Paralympic gold medallist in 2008 at the age of 13, will take part in the final London 2012 swimming trials this weekend. The Swansea-based swimmer attained four qualification times, including a world record at the British Championships in March and can secure her place at this summer's Games with victories in each of her S6 races at the British International Disability Swimming Championships in Sheffield. "I want to qualify for the Paralympics in four events [50m, 100m and 400m freestyle and 200m individual medley] and hopefully there's going to be some great racing and I'll really enjoy it," said the 17-year-old. And she added she is hoping to at least match the 100m and 400m victories she attained in Beijing at the London Games. "Hopefully I'll regain my titles," she said. "I'm going to try and enjoy the experience, but in the back of my mind I would like a few medals."